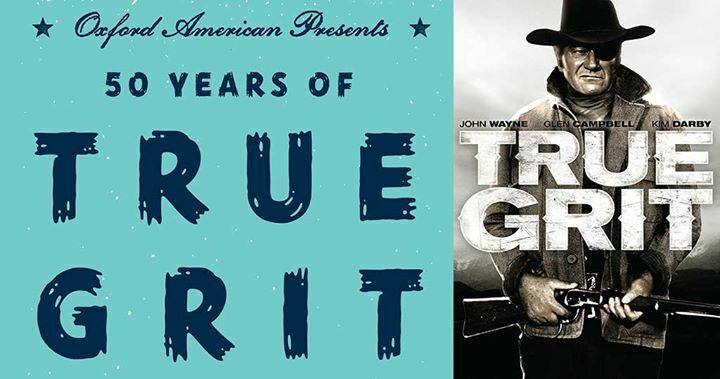 Throughout April, the Oxford American magazine haled a series of events to mark “50 Years of True Grit.” It culminated with programs over the weekend of April 20-21, 2018, to celebrate the anniversary of the publication of the beloved novel by Charles Portis, one of the magazine’s most acclaimed contributors. The festivities included panel discussions, readings, tours, museum exhibits, film screenings, and a special Saturday-night variety show, featuring comedy, music by Portis’s fellow Arkansas native Iris DeMent, and appearances and performances by the book’s notable fans. Published by Simon & Schuster in 1968 (after it was first serialized in the Saturday Evening Post), True Grit earned immediate popularity and critical praise as a rousing frontier adventure tale in which fourteen-year-old Mattie Ross seeks to avenge her father’s murder with the aid of a down-at-the-heels federal marshal named Rooster Cogburn. Over the past half-century, readers of all ages have come to treasure the book as a classic of American literature. The book has inspired two award-winning films-the 1969 version, which earned John Wayne his sole Academy Award, and the 2010 remake by Joel and Ethan Coen starring Hailee Steinfeld and Jeff Bridges. “So few books stand the test of time but True Grit’s literary reputation and its popularity have only grown in fifty years,” said Jay Jennings, a senior editor at the Oxford American and editor of the collection Escape Velocity: A Charles Portis Miscellany. “We thought the book’s landmark anniversary deserved a big celebration in the state that is the setting for much of the book and the home of both the author and the magazine.” Portis has published a number of humor pieces in the Oxford American and in 2010 was awarded the magazine’s inaugural prize for Lifetime Achievement in Southern Literature. In October it was announced that the Oxford American was the 2019 recipient of the Arkansas Arts Council’s Governor’s Arts Award for Folklife. This entry was posted in Film, History, Lecture, Literature, Music and tagged Arkansas Arts Council, Charles Portis, Ethan Coen, Governor's Arts Awards, Jay Jennings, Joel Coen, John Wayne, Oxfrod American, True Grit by Scott. Bookmark the permalink.